MAKE your own math. When you encounter problems and patterns, change them until you like them, and pose some of your own. Make what is useful, beautiful, or fun – for you! OPENNESS means you can find, change, and share your math. Open math is like a recipe, a folk tale, or an internet meme: diverse people remix it in diverse ways. ABUNDANCE is having a lot of math to choose from. Make and find an abundance of examples, models, and learning tools until you feel there is plenty. YES, AND is an invitation to improvise. Treat whatever you and others make or say as a prompt, not a mistake. Things don’t work until you make them work. Together, we can transform anything into math that makes sense. ADVENTURE in the strange human-made world of math, and you will encounter thrills, surprises, and even the occasional fright. Be the hero of your journey, and join others to explore and push the boundaries of the ever-expanding math universe. EASY COMPLEXITY is how a five-year-old learns calculus. Tell stories, make art, and find analogies that make your math friendly. Gently grow your happy familiarity with complex ideas. 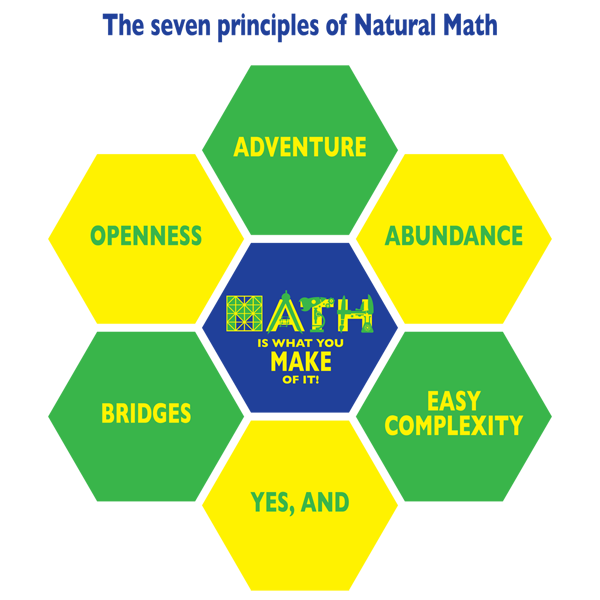 We make math easy enough for open play and complex enough for advanced mastery. BRIDGES connect and unite. Link math ideas to one another, math to other human endeavors, and people to math-rich communities. Connections help us to make sense of math, and to use math to make sense of life.